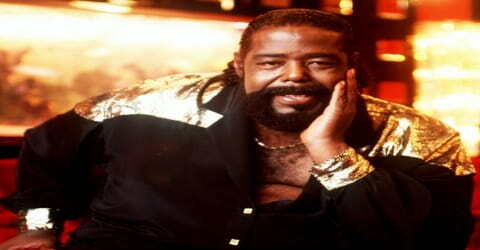 Barry White – American singer-songwriter, musician, record producer, and composer. 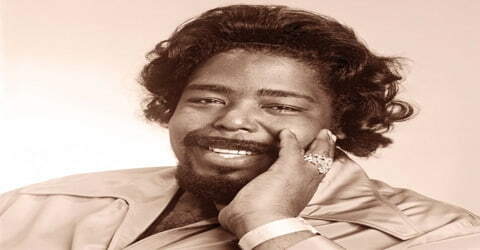 American rhythm-and-blues singer, possessed one of the most recognizable bass-baritone voices in the musical world, Barry White was born on September 12, 1944, in Galveston, Texas, the U.S. He was at home appearing on Soul Train, guesting with a full band on The Today Show, and appearing in cartoon form in various episodes of The Simpsons. During the ’70s, Dinah Shore devoted a full hour of her daily syndicated Dinah! show to White. 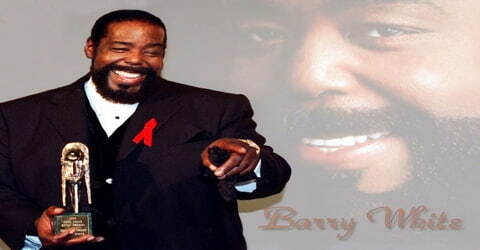 While there was a period where Barry White wasn’t releasing records or making the pop charts, he did stay active touring and appearing on other artists’ records including Quincy Jones’ “The Secret Garden (The Seduction Suite),” Regina Belle, and rap star Big Daddy Kane’s “All of Me.” It’s surprising to find out that such an illustrious career almost didn’t happen because White wasn’t interested in being a recording artist. The winner of two Grammy awards, he was a composer and singer-songwriter by profession. White took to music since an early age and showed signs of making it big someday, which he fruitfully realized. He started off as a significant part of various small independent groups and labels in Los Angeles. It was while working with the groups that he was spotted and enrobed to play the songwriter, session musician, and arranger for reputed labels. His biggest success, however, came when he launched himself as a solo artist in the 1970s. 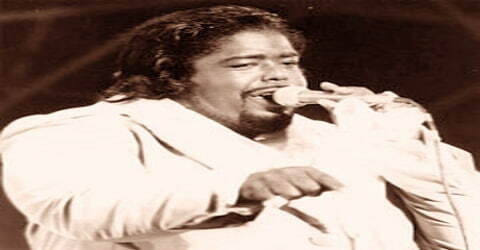 such as the amazing reception of his tracks that he became a pioneering force in disco music. About 109 of his albums reached the gold status, of which 41 attained the platinum status. During the course of his career in the music business, White achieved 106 gold albums worldwide, 41 of which also attained platinum status. White had 20 gold and 10 platinum singles, with worldwide record sales in excess of 100 million, and is one of the best-selling music artists of all time. His influences included James Cleveland, Ray Charles, Aretha Franklin, Elvis Presley, The Supremes, The Four Tops, and Marvin Gaye. 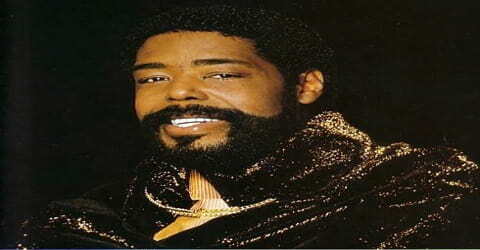 Barry White, by the name Barry Eugene Carter, was born on September 12, 1944, in Galveston, Texas, United States. His father was Melvin A. White, and his mother was Sadie Marie Carter. His parents never married, so his mother gave him her last name, but he later took on the surname of his father. He grew up in South Central Los Angeles, California. He was the eldest of the two children born to the White couple. Since an early age, White was musically inclined and grew up listening to his mother’s classical music collection. The first instrument that young White laid hands on was a piano. He emulated the music he heard on records and no sooner, played piano for Jesse Belvin’s 1956 single, ‘Goodnight My Love’. During his teenage years, White along with his younger brother took to criminal and gang activities. What’s more, he was also imprisoned for four months for stealing $30,000 worth of Cadillac tires. It was during his days at jail that he listened to Elvis Presley’s ‘It’s Now or Never’. The music inspired him spiritually and morally thus changing the course of his life completely. By the age of sixteen, White had fathered two children with childhood sweetheart Mary. They were married by the time White was nineteen and had four children together. The couple separated in 1969 and later divorced. White had a daughter, Denise White, born in 1962 as Denise Donnell to Gurtha Allen. She did not discover who her biological father was until 1988. White married the lead singer of the girl group ‘Love Unlimited’, Glodean James, on July 4, 1974. They had four children together and collaborated on the 1981 album Barry & Glodean. The couple separated many years prior to his death but never divorced. At the time of White’s death, he was dating Katherine Denton, who had given birth to a daughter four weeks previously, claiming it was his. Paternity testing revealed that the baby was not, in fact, White’s. Since White suffered from excessive weight issues for the most part of his life, health hazards were a natural occurrence for the final years of his life. He suffered from high blood pressure and diabetes and was diagnosed with kidney failure as well. It was while undergoing dialysis treatment that he suffered from a stroke which forced him to retire from public life. Relieved from the prison, White switched to civil life and took up a music career. He became a part of various small independent groups and labels in Los Angeles. His first ever released song includes, ‘Too Far to Turn Around’ along with the group, ‘The Upfronts. White released his solo songs in the 1960s, most of which were backed either by the vocal group The Atlantics or The Majestic. In the mid-1960s, he was hired by Bob Keane of Del-Fi Records as an A&R man. As a young man, White sang in a soul outfit called the Upfronts, and served as songwriter, arranger, and producer for a number of other minor bands of the era. Two 1965 solo tracks released under the name Barry Lee failed to catch on, and thereafter White concentrated on his career as a talent scout for the Mustang and Bronco record labels. During this time, White flirted with the idea of being a recording artist, making a record for Bronco called “All in the Run of a Day.” But he chose to stick with his A&R duties. One of the first groups he worked with was the Versatiles who later changed their name to the 5th Dimension. White’s first big hit came from an artist familiar to dancefloor denizens Viola Wills, whose “Lost Without the Love of My Guy” went Top 20 R&B. His salary went up to 60 dollars a week. White started working with the Bobby Fuller Four. Bob Keene and Larry Nunes who later became White’s spiritual advisor and a true friend wanted to cut a female act. White had heard about a singer named Felice Taylor. They had three hit records, “It May Be Winter Outside,” “I’m Under the Influence of Love,” and “I Feel Love Coming On.” They were huge hits in England. White started making 400 dollars a week. In the new profile, White started collaborating with label’s artists including Viola Wills and The Bobby Fuller Four, as a songwriter, session musician, and arranger. He wrote ‘Doin’ the Banana Split’ for TV bubblegum act The Banana Splits in 1968. 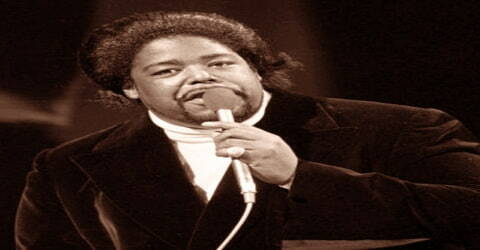 Furthermore, he discovered singer Felice Taylor and made arrangements for the release of her songs, ‘I Feel Love Comin’ On’ and ‘Harlem Shuffle’. Both the songs were major hits and established her as an outstanding singer. White helped launch a female R&B group called Love Unlimited in the early 1970s, producing their 1972 hit “Walkin’ in the Rain With the One I Love;” one of the women, Glodean James, eventually became his second wife. Offered a solo deal, White was initially wary about performing again but headed back into the studio anyway. The result was 1973’s I’ve Got So Much to Give and its hit single, “I’m Gonna Love You Just a Little More, Baby.” He also formed a side project called the Love Unlimited Orchestra, whose 1973 instrumental, “Love’s Theme” went to No. 1 and was said to have ushered in the disco era. While his career was scaling steadily, the big break still eluded. In 1972, he hit the jackpot by launching the girl group, ‘Love Unlimited’. The trio group, formed on the lines of the Motown girl group The Supremes, had honed their skills for two years before the launch. It comprised of Diane Taylor, Glodean James and her sister Linda. ‘Love Unlimited’ released their debut album, ‘From A Girl’s Point of View We Give To You…Love Unlimited’ in 1972. The song, released under the record label Uni, was a major hit and went on to become a million album seller. Meanwhile, in 1973, White initiated The Love Unlimited Orchestra, a 40-piece orchestral group to be used as a backing band for the trio-girl-group Love Unlimited. The same year, he wrote and released the single, ‘Love’s Theme’ which was played by the orchestra. The track was immensely successful and reached number 1 status on the Billboard Pop Chart. White got a release from Uni for Love Unlimited and they joined him over at 20th Century Records. Then he had a brainstorm for another concept album. He told Regan he wanted to do an instrumental album. Regan thought he had lost it. White wanted to call it the Love Unlimited Orchestra. The single, “Love’s Theme,” went to number one pop, was a million-seller and was a smash all over the world. The song earned him a BMI award for over three million covers. Soon after, Regan left Uni for 20th Century Records. Without Regan, White’s relationship with Uni soured. With his relationship with Uni over and Love Unlimited contract-bound with the label, White was able to switch both his production deal and the group to 20th Century Records. They recorded several other hits throughout the 1970s, “I Belong to You”, which spent over five months on the Billboard R&B chart in 1974 including a week at #1 and “Under the Influence of Love Unlimited”, which hit #3 on the Billboard Pop album charts. White married the lead singer of the group, Glodean James, on July 4, 1974. The super hit success of 1973 was followed by an equally successful 1974 which included the chartbusters, ‘You’re The First, the Last My Everything’ which ranked at number 1 on the Billboard Pop Chart and number 2 on the Billboard R&B Chart. The song, ‘Can’t Get Enough of Your Love, Babe’ peaked at number 1 on both Billboard Pop and R&B charts. His other super successful chartbusters include ‘What Am I Gonna Do with You’, ‘Let The Music Play’, ‘It’s Ecstasy When You Lay Down Next To Me’ and ‘Your Sweetness is My Weakness’. 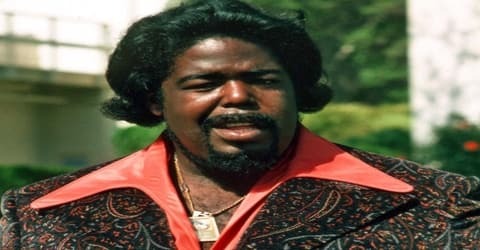 For the next five years, from 1974 to 1979, there was no stopping the Barry White Hit Train his own Stone Gon, Barry White Sings Love Songs for the One You Love (“It’s Ecstasy When You Lay Down Next to Me,” “Playing Your Game Baby”), Let the Music Play (title track, “You See the Trouble with Me”), Just Another Way to Say I Love You (“I’ll Do for You Anything You Want Me To,” “Love Serenade”), The Man (“Your Sweetness Is My Weakness,” “Sha La La Means I Love You,” “September When We Met,” a splendid cover of Billy Joel’s “Just the Way You Are”), and Love Unlimited’s In Heat (“I Belong to You,” “Move Me No Mountain,” “Share a Little Love in Your Heart,” and “Love’s Theme,” with lyrics). He also scored a soundtrack for the 20th Century Fox film The Together Brothers, enjoying a resurgence on home video. His six years of association with 20th Century ended in 1979, at the time of which he launched his own label, ‘Unlimited Gold’ with CBS/Columbia Records. Though White released quite a number of songs, he wasn’t able to replicate the success of his previous ventures due to the end of the disco era. A string of hit LPs and singles followed White’s debut LP over the next few years, including “Can’t Get Enough of Your Love, Babe,” “You’re My First, My Last, My Everything,” and “It’s Ecstasy When You Lay Down Next to Me.” They were lushly orchestrated R&B ballads in which “White created a fantasy world of opulence and desire,” the New York Times ‘ Jon Pareles noted. “As strings played hovering chords, guitars echoed off into the distance, and drums provided a muffled heartbeat, Mr. White spoke in his bottomless bass and crooned the reassuring sentiments” of his love songs. And though White’s “canyon–deep, butter–smooth vocals emphasized his songs’ sexually charged verbal fore-play,” noted a CNN.com writer, White always asserted that they were merely paeans to his wife, Glodean. It was only the 1982 released track, ‘Change’ that topped at the Billboard R&B Top 20 Charts at the number 12th position. Due to the heavy financial losses, White ended his label in 1983. Four years later, he signed a contract with A&M Records. The venture proved to be successful as the single released titled, ‘Sho’ You Right’ peaked at Number 17 on the Billboard R&B chart. After four years White signed with A&M Records, and with the release of 1987’s The Right Night & Barry White, the single entitled “Sho’ You Right” made it to the Billboard R&B charts, peaking at #17. In 1989 White released The Man Is Back! and with it had three top 40 singles on the Billboard R&B charts: “Super Lover”, which made it to #34, “I Wanna Do It Good to Ya”, which made it to #26, and “When Will I See You Again”, which made it to #32. During the course of his long career in the music business, White earned an astounding 106 gold albums, 41 of which also attained platinum status. After disco died out, his fame did for a time as well, but White was a respected figure nonetheless who was tapped to produce Marvin Gaye’s next album just days before the former Motown star was slain in 1984. White’s own comeback began in 1993 with an appearance on the animated series The Simpsons, and his 1994 LP, The Icon Is Love, sold two million copies. It’s single, “Practice What You Preach,” reached No. 1. His past hits were mined for the popular Ally McBeal television series, and he even appeared as himself on an episode of the show. Then in 1992, White signed with A&M, releasing the albums The Man Is Back, The Right Night & Barry White, and Put Me in Your Mix (which contains a duet with Issac Hayes, “Dark and Lovely”). The Icon Is Love became his biggest-selling album since the ’70s releases, going multi-platinum. It includes the platinum single “Practice What You Preach.” The production lineup includes Gerald Levert and Tony Nicholas, his godson Chuckii Booker, Jimmy Jam and Terry Lewis, and White and his longtime friend Jack Perry. While some later efforts buried his vocals in whiz-bang electronic effects, on The Icon Is Love, White’s deep steam engine baritone pipes are upfront in the mix. A 1999 record, Staying Power, earned him two long-awaited Grammy awards. 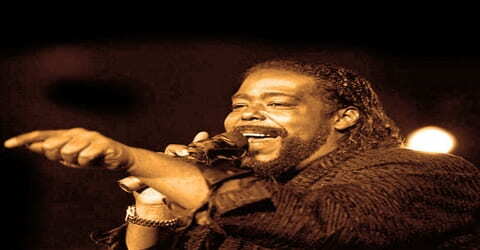 Barry White won two Grammy Awards in the categories of Best Male R&B Vocal Performance and Best Traditional R&B Vocal Performance for his final album, ‘Staying Power’. White was overweight for most of his adult life and suffered from related health problems. In October 1995, White was admitted to a hospital as a result of high blood pressure. In August 1999, White was forced to cancel a month’s worth of tour dates owing to exhaustion, high blood pressure and a hectic schedule. In September 2002, White was hospitalized with kidney failure attributed to chronic diabetes mellitus and high blood pressure. 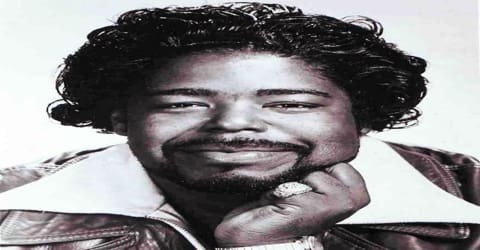 Barry White breathed his last on July 4, 2003, at Cedars-Sinai Medical Center in Los Angeles, after suffering from total renal failure. His body was cremated and ashes were scattered off the California coast. By the time of his death, Barry White had achieved a near-universal acclaim and popularity that few artists achieve and even fewer within their own lifetime. On September 20, 2004, White was posthumously inducted into the Dance Music Hall of Fame at a ceremony held in New York. On September 12, 2013, which would have been White’s 69th birthday, he was posthumously awarded the 2,506th star on the Hollywood Walk of Fame at 6914 Hollywood Blvd in the category of recording. The show Counting Cars paid tribute to White by restoring the last car he owned for his widow, Glodean. Especially popular during the disco-era the 1970s an era White helped set in motion with his Love Unlimited Orchestra’s “Love’s Theme” instrumental (1973) he half sang and half spoke romantic ballads in velvety sensual tones that, in combination with lush orchestrations, created an intimate, seductive mood. Among White’s numerous hit songs were two “Can’t Get Enough of Your Love, Babe” and “You’re the First, the Last, My Everything” that propelled the album they were on, Can’t Get Enough (1974), to the top of the charts.